Many investors turn to ETFs as a convenient way to participate in the gold market, without having to be exposed to the inconvenience and risks of buying and storing physical gold bars or bullion, or the complications of trading gold futures contracts. 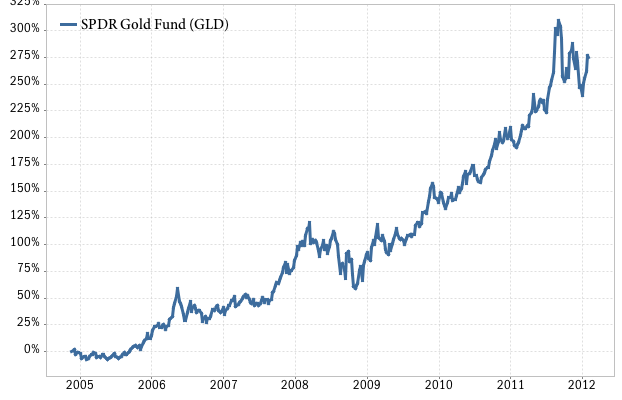 The first gold ETF was listed on the U.S. market in November 2004: the SPDR Gold Fund (GLD). The GLD fund has become so popular that it is now the second most widely held ETF in the world, with over 70.6 billion dollars under management. As a comparison, that’s more than the entire gold reserves of China! GLD invests in physical gold bullion, and the gold bars are held in the vaults of HSBC bank in London. If you’re so inclined, you can actually go to the website of SPDR Gold Shares and view a document listing every bar currently held by the fund (the file is over 1,700 pages long!) Each GLD share represents 1/10th of an ounce of gold. 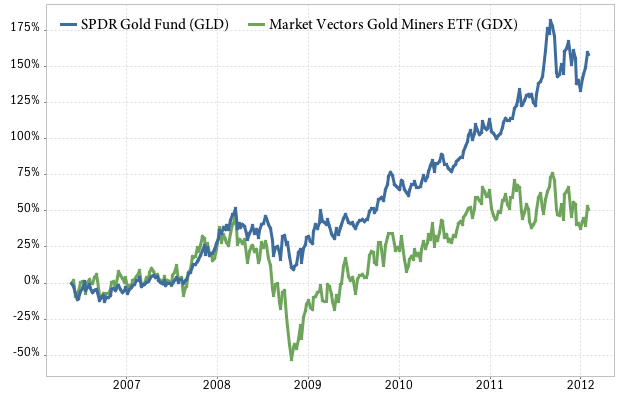 The chart above shows the performance of the GLD ETF since it started trading. An investor who had bought GLD shares in November 2004 would be looking at an over 300% gain by August 2011. Gold prices have come down a bit since then, but are still holding on to a very healthy 279% gain since 2004. That’s a compound annual return of just over 20 percent. 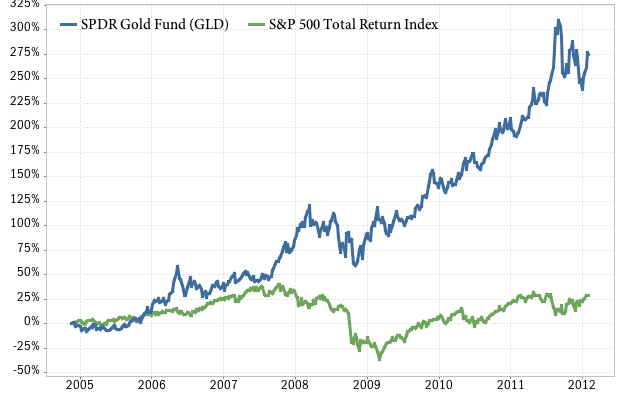 With returns like these, it is no wonder that investors are flocking to the GLD ETF. It is also worth noting that even during the most severe price declines of the 2008-2009 recession, gold declined no more than 27.7% from its peak value, compared to a loss of 54.6% for U.S. stocks. OK, now lets look at some other popular gold ETFs. Another very popular gold ETF is iShares COMEX Gold Trust (IAU), with 9.7 billion dollars under management. This ETF began trading in January 2005. Like the GLD fund, IAU also invests in physical gold bullion. The cost of securing and storing gold is significant and creates a performance drag on all gold ETFs that invest in the physical metal. Investors should be aware that the annual expense ratio of IAU is 0.25%, significantly lower than the 0.40% for GLD. If your goal is to establish a long-term position in gold, then IAU is definitely the way to go as it will outperform GLD and SGOL (see below) over time due to its lower expense ratio. Up next is the ETFS Gold Trust (SGOL), which was introduced in September 2009. Even though this is a fairly recent addition, SGOL has already accumulated about 1.9 billion dollars under management, making it the third most widely held gold ETF. Like GLD and IAU, this fund also invests in physical gold bullion, and stores its gold bars in secure bank vaults in Zurich, Switzerland. With an annual expense ratio of 0.39%, it’s also not as efficient as the IAU fund. Hmmmm. Not so good for the DGL fund, as you can see in the chart above. 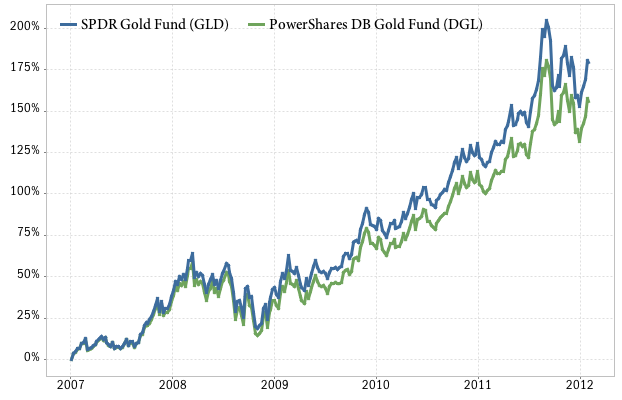 It has trailed the GLD fund significantly since its inception date in January 2007. An investor in DGL would have ended up with 23.1% less in gains over this time period. That makes bullion funds like IAU and GLD much better candidates for most gold investors. But there is one caveat: taxation. In the U.S., gold bullion is classified as a collectible, and is taxed at a rate of 28%, much higher than the normal 15% long-term capital gains tax on other securities, so ETFs like GLD and IAU are subject to this high rate. The tax treatment of futures based ETFs is complex (and I’m not an accountant, so seek professional help!). In general, gains and losses in a fund like DGL would be treated as 60% long-term and 40% short-term capital gains, giving it an edge in tax efficiency over bullion funds. However, judging by the large difference in actual performance, I would say that bullion funds are still a better investment option. Investors seem to agree: as of this writing, the DGL fund has about 410 million dollars under management, less than 6% the amount invested in the GLD fund. Since its inception in May 2006, it has significantly lagged the price of gold (as represented by GLD), and has compounded at a mere 7.54% annual rate, compared to 18.16% for GLD over the same period. What should also be obvious from the above chart is how fast and far the gold miners dropped during the economic recession in 2008-2009. The GDX fund had a maximum drawdown of 68.45%, much higher than the 27.73% in GLD over the same period (and also worse than the performance of stocks). GDX’s volatility (annualized standard deviation) is also more than twice as high as GLD. Also notable is the fact that the gold miners have basically been trading in the same range since the end of 2010, whereas the price of gold has continued to enjoy significant gains since then. Still, the GDX has accumulated 9.63 billion dollars in assets under management. Some investors describe GDX as a “leveraged play on gold.” It costs the mining companies a certain amount of money per ounce to extract and refine the metal, and beyond a certain point, as the price of gold rises “everything else is gravy.” I’ve seen this effect in 2002-2004, before the price of gold really took off. If you can identify small, barely profitable mining companies early on in an uptrend, watch out! But there are other factors at play. Gold miners are generally speaking not U.S. companies (many are in Canada, South Africa, and elsewhere). That makes an investment in GDX subject to some currency risk (the value of the US dollar compared to foreign currencies). So far, we’ve looked at five of the most popular gold ETFs. Both IAU and GLD are excellent “pure play” ways to invest in the gold market, and I give the nod to IAU because of its significantly lower annual expense ratio. The last time I checked, there were 51 different ETFs and ETNs to trade gold! In addition to bullion funds, futures based gold funds, and gold miners, there are inverse (short) ETFs, leveraged products (2x, 3x exposure), and a number of other ways to invest in (or bet against) the shiny metal. But that’s the subject of a future blog post. This entry was posted in Commodity ETF, gold ETF by david. Bookmark the permalink.